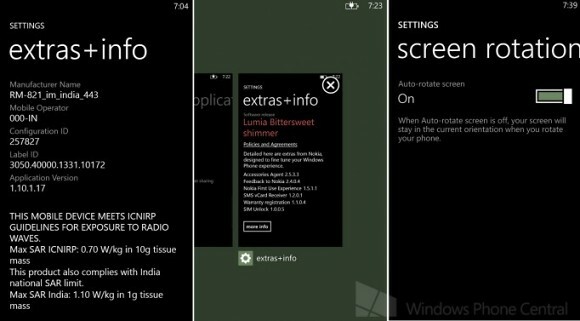 Some new changes to the upcoming Windows Phone 8 General Distribution Release 3 have surfaced along with information on Nokia's Bittersweet shimmer firmware. Aside from support for 1080p displays and more advanced chipsets, GDR 3 brings support for 3 medium or 6 small tiles on one row for devices with WXGA (1280 x 768) or higher resolutions. That means the Lumia's 920, 925, 928 and 1020 will receive the alleged tile support along with the HTC Windows Phone 8X. As we've seen before the app switching interface has an X for closing apps (no swiping here). There are custom tones for text, email, reminders, IM and voicemail. A new feature is attaching Office files to emails, which will certainly be much appreciated by the WP loyals. Screen orientation lock is also incoming along with a new Driving mode, which stops all notifications except texts and phone calls while you're driving. Nokia's Bittersweet shimmer firmware will bring 20 new accent colors for Glance Screen's night mode (currently just Red in Amber). Glance screen will also have notifications, like the lockscreen. There will also reportedly be new apps - Nokia Camera and Storyteller.